What is a “Celtic” mandolin? How would you define the Celtic mandolin as opposed to any other mandolin? For the purposes of this article we will compare and contrast a “Celtic” mandolin with the Gibson A4 and F5 models. Why? Because they have become the two “standard” mandolins used in western music today. There are few hard and fast rules when it comes to defining anything. There are always exceptions. But the fact remains that a type of instrument is being made with the folk and “Celtic” musician in mind. In researching this post I came across a whole load more interesting stuff about the history of the instrument in folk music, so time permitting I shall add a few more articles on the subject. People love getting upset over definitions they see as inaccurate, but here is mine – brace yourself…. Some will be nodding in agreement, others will be reaching for the heart pills. But there are other differences beyond their allium roots. The back of a Gibson mandolin is usually carved from solid wood. Usually, solid maple, mind the backs of quite a few A models are carved from birch. The arched carved design owes much to the violin. The back of a “Celtic mandolin” is usually flat or gently curved. It wasn’t until I nagged Stefan Sobell into trying birdseye maple in the late 90s or early 00s that I saw a Celtic mandolin with a carved back rather than flat or curved like a conventional steel string guitar. If you know of an earlier carved back “onion” shaped Celtic or Irish mandolin please drop me a line and let me know so I can add to this article. 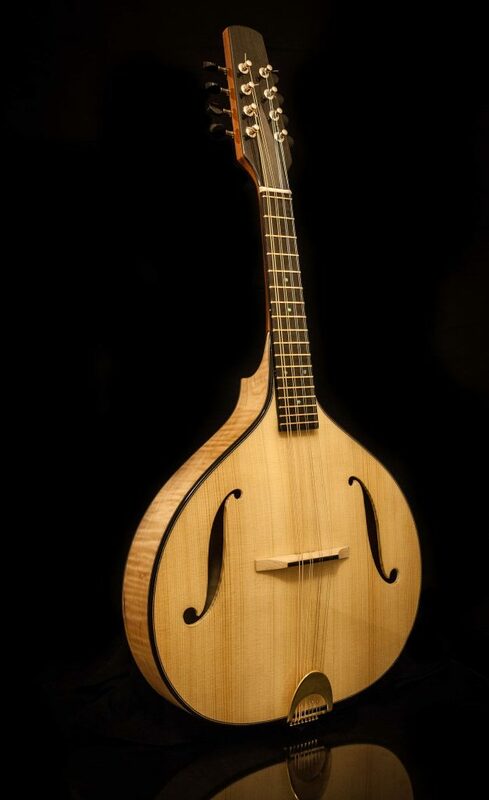 The soundboard of a Gibson mandolin is usually carved from solid spruce. The design owes much to the violin. The soundboard of a Celtic mandolin depends on whether it is cheap or expensive, or on the skill of the maker. Cheap instruments tend to have flat, thin, curved, bent or canted soundboards of spruce or cedar. More expensive work has a top carved from solid spruce or Western red cedar. Gibson F5 and A5 mandolins usually have “F” sound holes, like those of a violin, only a little larger. The F4 and other A models have a oval hole. Most Celtic mandolins have either a round, elliptical or similar shaped sound hole. In short, there is more variation of style. Most Gibson mandolins and those made in that style are usually braced with “tone bars” two braces asymmetrically placed slightly off parallel with each other, and placed below the adjustable bridge at a point corresponding with the bridge adjustment posts and run from tail to head. The more simple “A” models often have only one small brace between the oval sound hole and the bridge, at 90′ to the grain. Celtic mandolins hold to a less conservative tradition and most bracing patterns have been tried. They can be split into two broad camps: cheaper flat topped instruments tend to be either ladder braced or X braced. Arched work, which I find generally to be superior is usually X braced. Nothing is ever clear cut: some makers of more “American” style work have also experimented with the X brace, the best known case, Steve Gilchrist of Australia who makes magnificent mandolins destined for the Bluegrass market, did so by having the X intersection directly below the bridge. With a Sobell Celtic mandolin the X brace intersection is placed as high up the body towards the neck as is possible. The shape of the sound hole reflects this. They also have a structural brace which covers the soundboard centre join starting near the tail and ending shy of the bridge. Here is a picture of one of my earlier mandolin tops in the making: an NK Forster mandolin soundboard, (thanks to Dave Best for the photograph) where you can see not only the “Sobell” centre brace but a Gilchrist inspired pattern, with the X intersection below the bridge. Cheaper mandolins often have a flat top, whether “Celtic” or like the old Gibson “Army-Navy” mandolins. Building this way has its advantages, it’s quick, and therefore cheap, it can on occasion make for a loud and coarse sounding instrument. Some like this, some don’t. But with a thin flat top and a high bridge comes a significant drawback. 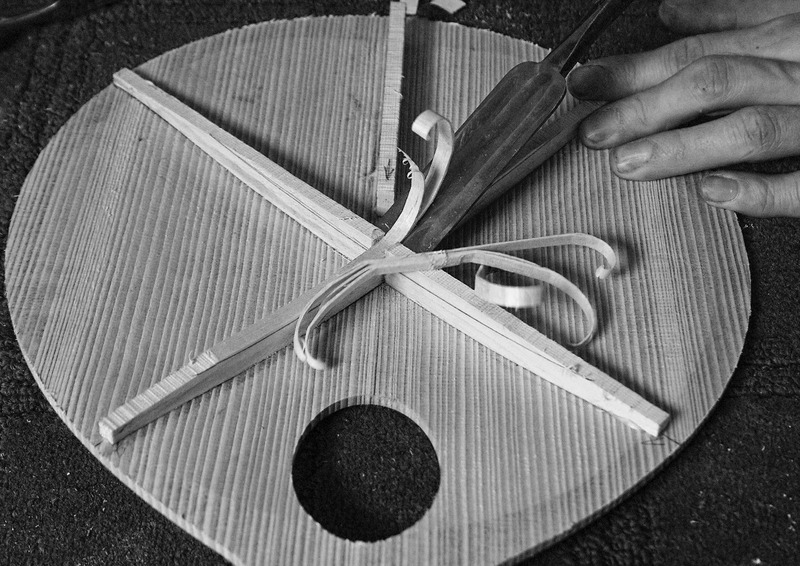 Unless you were lucky enough to pick a very strong piece of wood for the soundboard, you make an instrument with a fairly short life. They cave in. So to avoid this it can be necessary to “over build” the soundboard which doesn’t do much for sound. More expensive work,”Celtic” or otherwise is carved and arched. The soundboard arching of Gibson style mandolins again owes much to violin making. Like the violin they often feature a “recurve” just in from the perimeter of the ribs. The recurve function is yet another subject folk love getting worked up about so we shall leave that for another time. What is worth saying is that it’s rare to see a “Celtic mandolin” with a strong recurve, the reasons for this would once again bring us into the realm of speculation, but carving a recurve takes time and skill, two qualities not available to every maker. For many, the back and sides of a Celtic mandolin should not be like a Gibson, they should be rosewood or mahogany, perhaps cherry or sapele. Anything but maple. 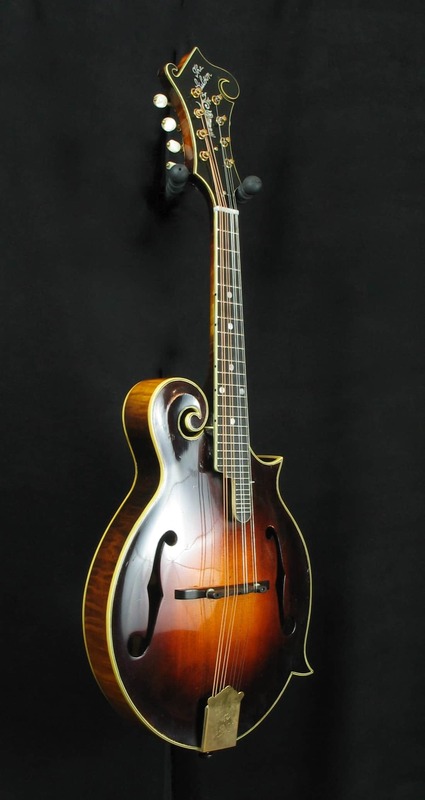 Until the late 90s, Sobell mandolins (what you could describe as the quintessential Celtic mandolin) were usually made of European spruce or (American) Western Red cedar for the soundboard, Indian rosewood for the back and sides. Later this changed to spruce and maple. Among other respected makers: Fylde, Moon etc, there are many variations. The majority of instruments based on Gibson mandolins are generally made with an American spruce (Adirondack, Sitka or Englemann) soundboard with the back, ribs and neck usually made from hard American maple or on cheaper instruments, birch. Gibson F models usually (perhaps not always, I’m no expert on Gibson mandolins) have necks made of maple, I’ve seen A models with mahogany, birch and maple necks. Fretboards are generally ebony. With the Celtic mandolin, the more expensive work I’ve seen has a mahogany neck and an ebony fretboard. Cheaper work comes in all manner of woods, some of which are suitable for making instruments, some not. The actual shape of a Gibson F model is decoration enough for most folk with its beautiful scroll and pointy bits. So the additional decoration is pleasantly sober: the headstock usually has some peal inlay and occasionally on the fretboard too. Gibson mandolins tend to have a rather nice type of binding, an acetone based plastic which resembles ivory. It’s called ivoroid. That along with simple purling lines tends to be the end of it as far as American mandolins go. There is a much broader range of decoration used in Celtic mandolin making. 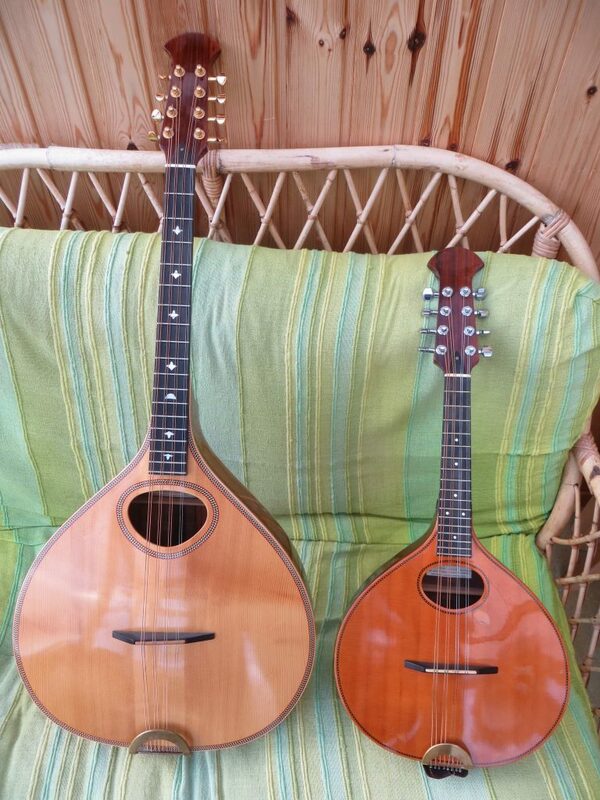 Sobell mandolins like Sobell Cittern and bouzouki are sober in appearance with simple herringbone or crowsfoot purfling, and rosewood or maple binding. Other makers tend to be more fancy. My own feeling is “less is more”, and I’m yet to play a decent instrument with any of that gaudy Celtic knot decoration which is rather common amongst instruments destined for the export market. But I’m happy to be corrected on this point if they exist. I’ve not played them all. So why do Celtic mandolins look like they do? What we do know is Sobell has certainly been a key figure in the creation of the “Celtic mandolin”. He made a lot of mandolins that look and sound different from their American cousins. From the late 70s on, many key “Celtic” musicians played them. 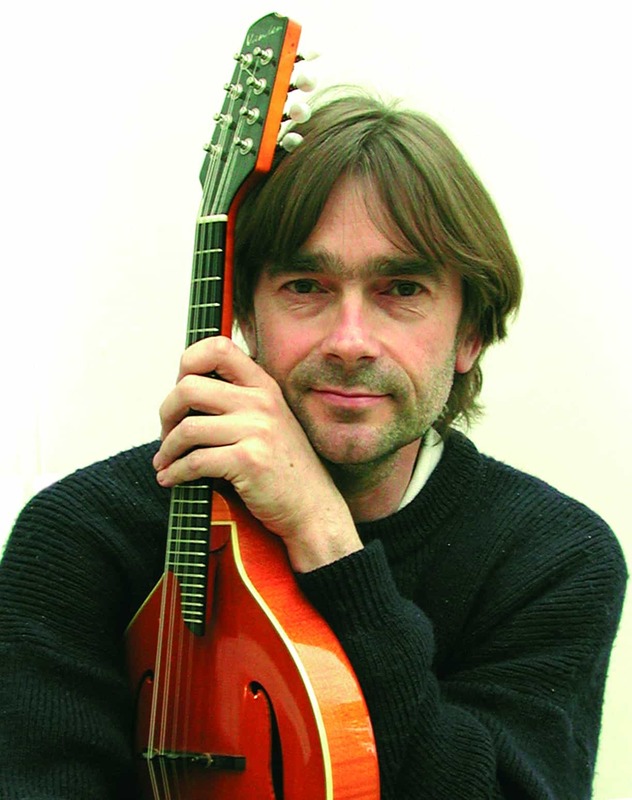 I do recall one conversation in the late 90s during my time working for him: Stefan told me that in the 70s, when people asked him to build mandolins, what they asked for was a miniature version of his Cittern and octave mandolins. So that’s what he made. to his cittern and octave mandolin, and made of the same materials. Like a cittern had been put in the wash on too high a temperature. Hence the “onion shape” and that a Sobell mandolin can have either 8 or 10 strings. What we also know is that the Portugese guittara was a significant influence in Stefan’s creation of his OM and Cittern design (aesthetically at least), so it should come as no great surprise that the “Celtic mandolin” looks a lot like the Portuguese mandolin….and the Brazilian Brandolin. But do Celtic mandolins really have to be that shape? That depends. For some folk, the answer is a resounding yes. Association is a powerful thing. Think of how the Selmer guitar sound and Gypsy jazz go together… Selmer Maccaferri guitars were magnificent guitars for sure, but they were also possibly the only good quality instrument available to Django Reinhardt and his chums in France in the 30s. It could be the percussive sound they make had an influence on the music. Try playing that style on any other guitar… Does it work? Not to my ears. Not unless you’re Perrie Willie. Does it look right? No, not to my eyes! At the same time, it looks odd to see someone using a Selmer style guitar for any other type of music than Gypsy jazz. Association is a powerful thing. Likewise by the 80s it was a rare folk musician who didn’t either own or aspire to own a Sobell mandolin, OM or cittern, and to some extent you could argue they were also more available than American instruments which have never been as common in the UK and Ireland as one might imagine. Sobell, Fylde and one or two others (and there really were not many makers then,) made the best instruments around. And whilst early instruments by these makers could be described as more “homemade than handmade,” they were usually better and more playable than the many low quality bowl back mandolins you could come across quite easily in second hand shops. In the 70s and 80s and on, Sobell instruments became the standard for many British and Irish folk musicians, the sound of those instruments became synonymous with the music. As a result people don’t associate that American “woody” bass and thick treble we find in the best American mandolins like Gibson, and their many imitators with Celtic music. Instead we associate the twinkly lighter treble along with a smoother bass. “It’s maybe worth remembering that in the early seventies the mandolin was generally quite a prominent instrument in folky bands, and was used by the Dubliners, Fairport, Boys of the Lough, Planxty, Horslips, Hedgehog Pie, Lindisfarne, the MacCalmans and plenty others. “Sometime in 1981/2 perhaps, I was up in Coigach, where my Father’s family is from, and I chanced to hear the Battlefield Band live in the village hall. Duncan MacGillivray on pipes, Reid & McNeill, and Ged Foley on guitar and mandolin. I approached Ged at the end to ask about his superb sounding mandolin, and this was my first contact with a Sobell mandolin, which he kindly let me try. I was spellbound and became fixated with getting one. Again, Kevin’s influences at the time were Andy Irvine, Johnny Moynihan & Charlie Piggott in the early De Danann albums. For many people, yes, a Celtic mandolin should look and sound a certain way. It may be due to association, it may be because that sound suits their playing style better. You just can’t get those rich harmonics and that ringing sustain from a Gibson mandolin. Any Gibson mandolin. But not everyone feels the same way. For others the answer is an equally resounding “no”, you can play Celtic music on any half decent mandolin. Some actually prefer a Gibson as we will see soon. Actually, even owners of high quality Celtic mandolins often reach for something else when heading to a session. 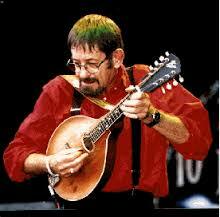 “I’m not sure that a mandolin can define a Celtic sound, as I have reservations about that invented term anyway. Scottish music is very different indeed from Irish and other idioms. My playing style relies heavily on the articulation of the dotted crotchet and quaver building block of the music, and the longer note can be made to ring longer on a Sobell, for me. But I can do the same on the F4, it just has a different voice. I can do the same on the National, and the volume is such that I can hear in a session. 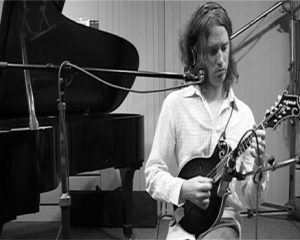 Mandolins rarely cut in sessions, unless they are F5s driven by skilful players like Luke Plumb. When heading for a session, Kevin takes a National RM1. Most who play mandolin use the tuning GDAE (bass to treble). A greater variety of tunings can be found amongst folk musicians. You will find those who play in standard GDAE, but just as common is GDAD. Usually 10 string mandolins are tuned DGDAD, DGDAE or even DADAD. There are probably other variations. The relationship between design and sound. “Flat top instruments…which can be gorgeous, immediate and delicate, lack a strength that doesn’t stand up to ferocious technique – they’re not designed to have to! 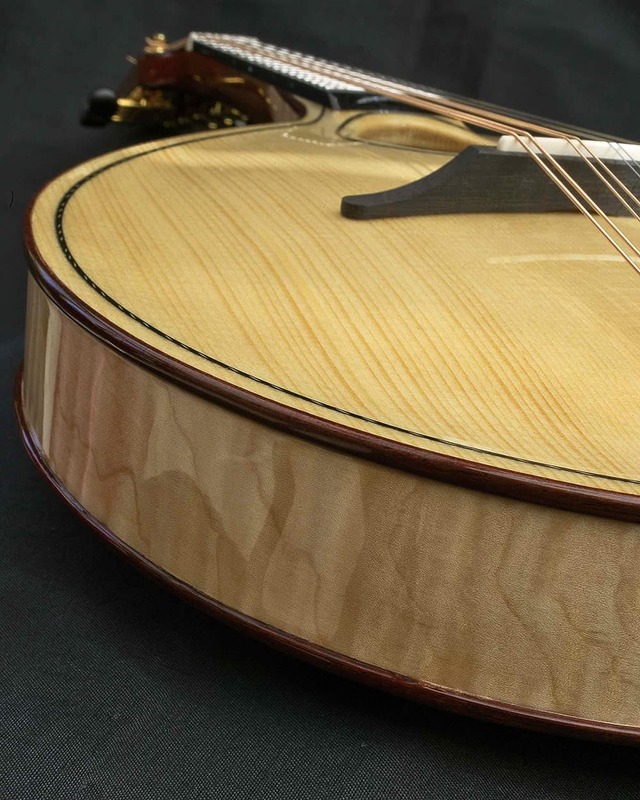 The carving (of f style mandolins) provides stability for heavier technique where the wood is really being driven and the sound is very responsive as a result. My style though lends itself more to an instrument designed around clarity and dead evenness where one note doesn’t linger over the next. That’s a BIG sacrifice in sustain and “lush” overtones but it suits my way of playing better. It was through gigging that Luke became aware of the shortcomings of using a flat top instrument. He and fellow band members were trying to adopt (and very sensibly in my view) the American Bluegrass style of playing into condenser mics rather than using piezo pickups. A trend which I’m glad to see finally spreading amongst British and Irish musicians. “We were using microphones exclusively on stage and the difference with the carved vs flat topped instruments was really noticeable. …For this style of setup (using condenser mics), the flat top instruments lacked the mid range penetration that carved instruments inherently have. What’s beautiful about a flat top instrument is its complex and delicate overtones in the top end and its warm and expansive low end – both from the light building which allow the strings to ring with sustain. In a live setting with studio mics, the low end tends to get boomy and cause feedback and the top end is lost anyway in amongst the other instruments and the ambient noise of the venue. What’s more useful is a tight and clear bottom end – present but not susceptible to being overpowered by feedback, a clear, bell-like top end which the microphone can reproduce well, but that will still cut through and most importantly a mid range that can serve the function of the instrument with clarity and again – penetration. I really see the mandolin as occupying a role – it doesn’t need to supply the bottom end as a guitar or bass will do that far more efficiently, the top end will never be as present as a fiddle and bow but the mid to upper midrange is where it can shine. Carved instruments really focus on that part of the instruments sonic makeup in my experience. Simon Mayor is another well known player of “Celtic” mandolin and the author of several good books on the subject. I asked him what he looks for when buying a mandolin for Celtic music. “I think a choice of instrument is very personal, there are no ‘rights’ or ‘wrongs’, and I’m not too worried about what instrument should be used for what kind of music. I decided a long time ago that I wouldn’t play the mandolin in trad music sessions; even a good mandolin is too quiet to compete with massed fiddles and accordions and you end up ruining your technique just trying to be heard. So, I choose instruments based on tone and playability rather than sheer volume. I prefer shallow-bodied, Gibson-style mandolins rather than the deeper bodied ones used by many trad players. I look for an instrument that responds well in the higher registers and has a huge sustain. You find so many mandolins that sound good down in first position but the response dies as you move higher up the neck, so an even response across the entire fingerboard is really important, so you don’t have to compensate for the instrument’s deficiencies as you play. I’m not bothered about having the decorative scrolls and points too much, just a simple teardrop shape that rings like a bell is my ideal. Kevin Macleod owns both an old Sobell and a vintage Gibson F4. How does he describe the differences between them? “”Vastly different sounds. The Sobell is open, ringy, longer delay, but clear, bell-like, balanced and bright. Warm on lower two courses. Here is Ian Stephenson playing one of my Celtic F mandolins which I feel are very suitable for Celtic music, having the “European” sparkle in the treble with a woodier bass. Supply and demand is never far away when it comes to the price of things. With the Bluegrass mandolin market being larger than the Celtic mandolin market, there is a significant price difference between what the best instruments intended for the Bluegrass market in comparison to those built for folk musicians. The vintage market is much larger for Gibson style mandolins too, with vintage “Loar” mandolins fetching astronomical prices. Price wise the Celtic market is once again split into two camps with flat, bent or canted top mandolins often being very affordable. It’s always worth keeping in mind how similar in design and construction cheaper Celtic mandolins are to the old Gibson Army-Navy models. These type of mandolins are made quickly and sell cheaply. They are what they are, some are good and some are not. It would be generous but also erroneous to attribute too much skill to the maker if one happens to turn out well. Especially when looking at factory work. So what a Celtic mandolin “is” differs from one person to the next. In the end it’s all down to preferences, and what a working pro musician like Luke Plumb requires from an instrument (he plays a very nice Gilchrist F5 model) may well differ from what someone wants who plays down the pub on a Sunday night and doesn’t want to worry about it getting damaged if the person next to them has had one too many sherbets. The future of Celtic mandolin making? From a makers perspective, Celtic mandolins vary in quality too much for my liking. For a number of reasons I find the general standard of design and making to be low. Some do perform well in the environment for which they were intended – the session, but not many. 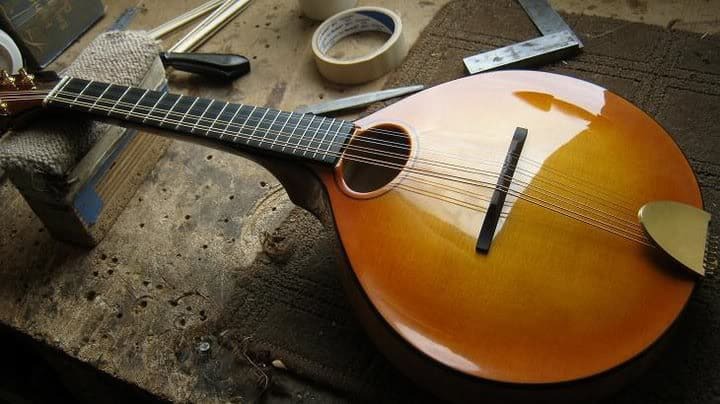 Celtic mandolin design seems to suffer from a type of “ossification” which may well be due to the size of the market – the rewards for coming up with a better design are small. That the “Celtic” mandolin market is very limited and even the most sought after work commands prices far below their Bluegrass counterparts. There is (in the folkie world of mandolins) a very clear “two stage” price ceiling, of cheaper/pricer work and that breaks down pretty much to flat top/carved top. I know which ones I prefer but if your experience is different, that’s fair enough. I much prefer the sound of a well made carved top mandolin. I’ve played many over the years and the better carved top Celtic mandolins have been much superior to the flat top ones. It’s possible one day I might come across a flat top mandolin that could change my view, but it hasn’t happened yet, hence the stance I take in this article. But the reality is this: the majority of customers are happy with a flat top Celtic mandolin likewise the majority of mandolin players in the folk world just accept the fact that in a session they may well have to take a different instrument. 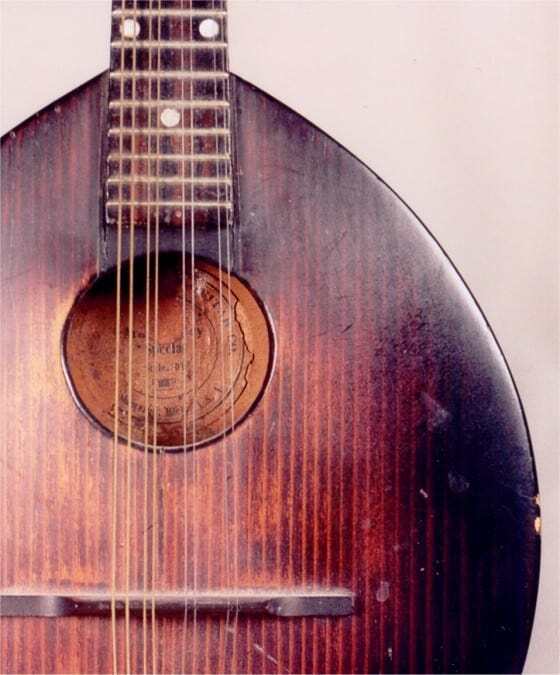 Carved or flat, onion shaped round hole mandolins rarely perform well in a session. There is a tiny gap in the market for a better Celtic mandolin, for an instrument that can perform in a session, on stage and in the studio. 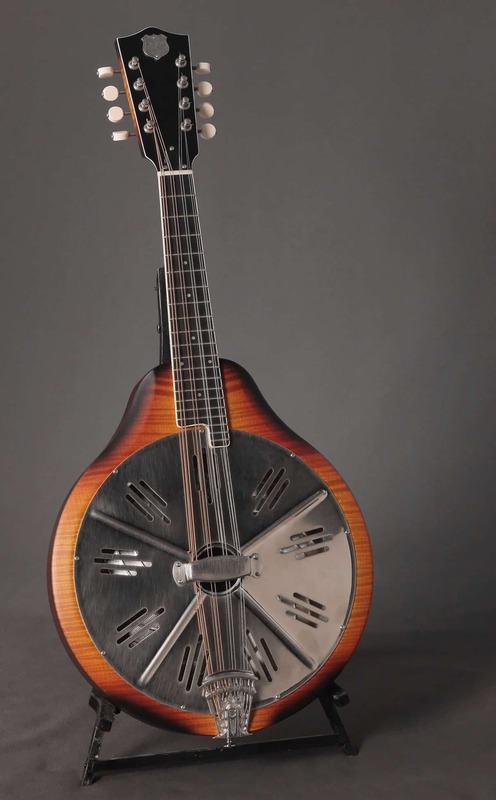 Whether it’s flat top or carved top isn’t so important, other than it will be far easier to sell a superior flat top mandolin as they’re cheaper and quicker to make, and therefore more accessible to the musicians. Until such an instrument appears the market will remain as it is and the mandolin will remain on the sidelines when it comes to “Celtic” music. For me personally it means I’m going to experiment with both designs – carved and flat. I never thought I’d be doing that, but we have to work with the market as it is, not how we want it to be. I’ve no idea what the outcome will be, but putting is article together has rekindled my interest in Celtic mandolin design, hopefully it will do the same for other makers and players too. I certainly have strong views about mandolin construction, sound, performance and design, some of which have crept out in this article, and I’ve plenty more on the subject. But please keep in mind these views are based on years of working for Sobell then for myself, views based on making many mandolins at what you could call the “high end” of the “Celtic” market. These views of mine are also based on listening to musicians and listening to makers like Steve Gilchrist who have really pushed the instrument to its performance limits. So if you’re serious about getting a good mandolin for playing Celtic tunes, you might want to send me an email. I’ve made a few in me time.